We have studied the unusual variability in the pulsed radio emisssion from the Large Magellanic Cloud pulsar PSR J0529-6652 using observations at 1400 MHz with the Parkes radio telescope. 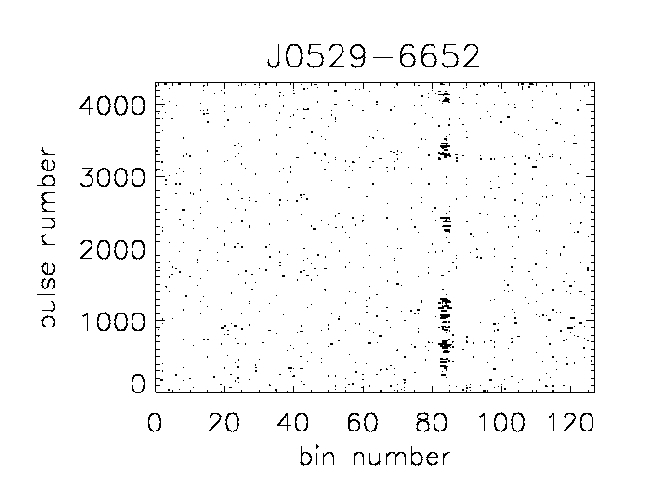 PSR J0529-6652 has a very large modulation index at (4.07 +/- 0.29) and a measured nulling fraction of about 80%. This pulsar is also the second giant pulse emitter currently known in the LMC (after PSR B0540-69). Details of the study can be found in the article "Variability of the Pulsed Radio Emission from the Large Magellanic Cloud Pulsar PSR J0529-6652" by F. Crawford et al., Astrophysical Journal, 762, 97 (2013). Below: Pulse number vs. phase for PSR J0529-6652. Below: Single pulse detections of PSR J0529-6652 at 1400 MHz. S/N is plotted in grayscale vs. DM (on the vertical axis) and time (on the horizontal axis).